A worm drive is a gear arrangement in which a worm, a gear in the form of a screw, mates with a worm gear, smaller in appearance than a spur gear and also called a worm wheel. 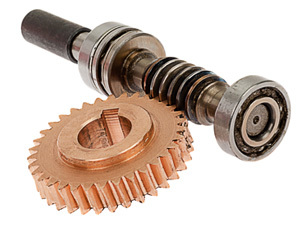 Like other gear arrangements, a worm drive can reduce rotational speed or enable higher torque to be transmitted. A gearbox designed using a worm and worm-wheel will be considerably smaller than one made from plain spur gears and has its drive axes at 90° to each other. B&F can manufacture worm wheels with a maximum diameter of 1220mm and worms with a maximum diameter of 230mm. Maximum pitch is 10MOD.